Most of you probably remember Waiting is Magic quite well, and those of you with iPhones will be pleased to know that the game (no, not that game) is coming to the iOS platform. That's right: you'll be able to play WiM on the go! According to Penta Studios the port is almost complete, but before submitting it to the App Store they want some beta testers to make sure that there aren't any major bugs in the final version. 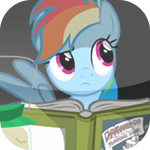 Interested in playing Waiting is Magic on your iPhone before everypony else? Then visit their post at http://pentastudios.com/news/Waiting_is_Magic_iOS_in_beta_ and leave a comment with your UDID. Happy testing!